Ventus Vitae is located at 1880 Century Park East in Century City. A vocation, a calling, an urge, aptitude, talent, ability, an obsession; who knows why I, or anyone, does what they do? I have been consumed by a necessity to search for and express meaning – why are we here? where are we going? what are we doing? – and the visual arts have let me put that necessity into form. Credit where due: the vocation had its ground at California Lutheran College in 1964-67 under Jerald Slattum, John Solem and Bernardus Weber. Instead of saying why I do what I do, I was invited to explain here what my use of water in art has taught me about water. My real connection to water comes through my use of glass. Water is glass is water is glass. Glass is my medium, and water is its mate. Water/glass has no shape. Its infinite shapes and the transitional phases between its liquid, gas and solid states are parallel to the ambiguities of life. My senses are my most valuable source. Of water, I ask, what does it do to my sight, sound, touch, taste, smell? How does it affect me? When I submerge myself in it, when my body is “in touch” with it, when my eyes are filled with the infinite shades and tones of its sounds, textures and colors, when my senses are “in tune” with what it is … what, then, does it make me feel? I completed an architectural commission, including a fountain, in Century City in 2008. My client specified that water be incorporated into the work. My design concept was a 55- by 15- by 12-foot-high sculpture of glass, water, granite, light and sound. 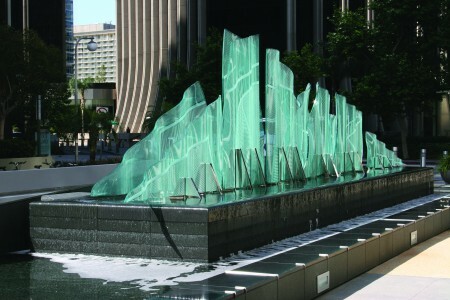 The sculpture, Ventus Vitae (“Winds of Life”), was based on five aesthetic elements: water, glass, movement, sound and light. The combination of elements would give off an aural and visual feeling of tranquility to contrast with that busy space and the noisy activity of nearby traffic. Water was indispensible as a means of drawing people right up close. The large-scale sculpture obviously can be enjoyed from a distance, but, with water as a medium of attraction, it draws passers-by to the sounds and reflections. From that vantage, they can go deeper into the complexities of the overlapping glass panels, their contours and the dance of light on their etched surfaces. We are all made of water and we all have a history with it. Besides drinking it, sending it down toilets, and being bathed in a galvanized tub that was heated on a stove, my first memorable, earthly interactions with it were swimming and fishing in the streams and lakes of Wisconsin, skating and walking on it (frozen), and feeling its effect on the body (as a gas) on those hot muggy Midwest nights. My earliest rendezvous with water was when my father was 8. That is when he began drinking it mixed with 6 percent to 50 percent alcohol. I was born when he was 35, and by this time he was well on his way to being consumed by “water.” He left “life” when he was 58, having experienced what water and its excess condiments can do for the human body. I don’t know what all that means for my art, my vocation. But I know from experience that no other material deals as glass does with light, line, movement, change, intensity – all things visual – while also paralleling life and having an inner and an outer self, or presence-being. And that water is glass is water is glass. A wall-mounted glass and stainless steel sculpture by Luebtow and works by 18 other alumni artists are on display through Jan. 8 at the William Rolland Gallery of Fine Art.